Finding the perfect playlist to match the type of workout I am doing is an ongoing quest of mine. There’s probably no way that your taste in music matches mine. I was reminded of this during a spinning class on Wednesday. Everyone has different tastes in music. I loved it when my spinning instructor played Dance of the Sugar Plum Fairies! (It starts slow and gets fast.) Run Run Rudolph is another holiday favorite of mine. It’s a fun and fast one that I love. Not everyone appreciates those I guess. I find that exercising to music makes exercise fun. In fact it’s not a work out, for me it becomes a “play out”, but there are some challenges in getting the music worked out. Actually obtaining the songs to play them when you want them. – do you use Pandora or Spotify? Or do you buy music from iTunes? Or move a song to your playlist from your CD? Getting the right device to listen to them – Bluetooth speakers? Ear buds? Built in speakers in a beanie? Play the music out loud for everyone to hear? This past Sunday afternoon, when the weather hit 63 degrees here in Ohio in December, I took a bike ride with 7 of my friends. The group of us witnessed a runner crossing a road right in front of an ambulance with lights and sirens. It seemed impossible he didn’t see or hear it. There is a dip in the road, so when he glanced to the right, the ambulance was obscured by the hill. But we decided that it was the Noise Cancelling Headphones that made it so he could not hear the ambulance. WOW was that scary. Luckily the ambulance driver was alert and averted a bad accident. We were all waiting at the edge of the road on the bike trail and witnessed the whole scene unfold just five or six feet in front of us. He was totally oblivious. In fact, he looked at us weirdly because of the panic on all of our faces. It was almost like a scene from a movie. He just continued running down the bike/hike path behind us like nothing had happened. It took about a half mile on the bike before the adrenaline washed away from my arms. Please, if you use noise cancelling headphones, don’t use them on a bike trail or anywhere when you’ll be crossing a road. It can be really bad. I had no idea that they worked that well. My preferred way of listening to music during a run was with my old headband. I had cut some holes in the headband and slid some old headphone speakers into it for my outside runs. Sometimes for a bike ride, I would pull the headband down around my neck like a scarf. Much safer. Pretty ugly. I still don’t have the right answer. 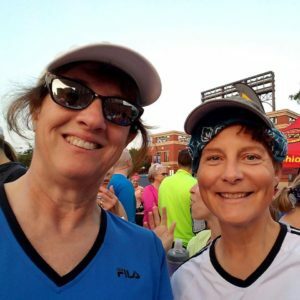 When I’m running I have the neckerchief or headband fit under the baseball cap. You can see me with a version of it on in this photo and the old white headband in this photo. I tried using it for the 2018 half marathon but it failed me and I had to do the run music less. 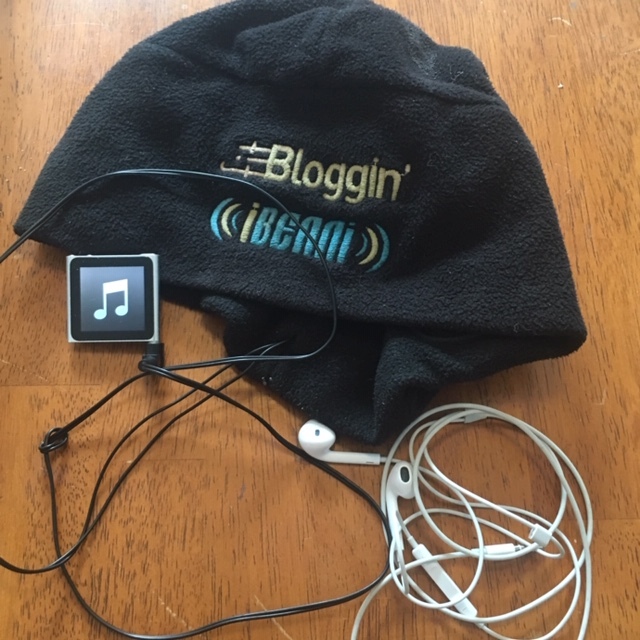 During the winter, I use my iBeanie hat (a swag gift from the first FitBloggin’ conference I attended in Baltimore.) I don’t think the company makes these anymore, but here’s a link to something similar. This Bluetooth Beanie Hat that has built in speakers, which is great in the winter but way to hot if the weather is over 50 degrees out. (Mine is old and has wires that plug into my old iPod.) I like to keep the speakers off my ears so I can hear foot steps behind me. Because I run slowly, all runners (for the most part – and even many walkers) pass me and I don’t like to be startled. I got some Bluetooth headphones last year for Christmas, but have had only some luck getting them to connect all the time. 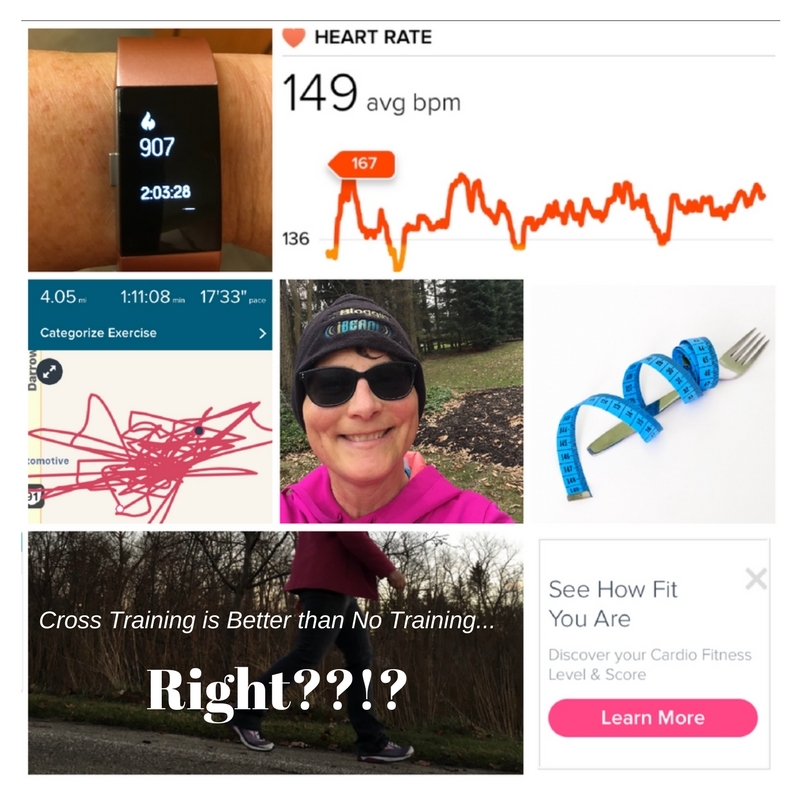 After getting a way to play the songs, I judge if I will like the music for a work out is to imagine if the song just started… would I want to get up and run out to the dance floor? If the answer is yes, then I’ll probably add it to my play list. Some songs make it to the play list only to be deleted a few weeks later. There are lots of songs that end up going on the play list over and over. 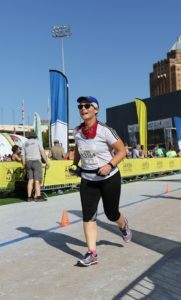 I have different songs for running than I do for yoga or walking or even bike riding. Anyway, back to what I wanted to write about – workout music that matches the workout. I like songs that have a beat that matches my cadence. I’m not a fast runner by any means. My playlist matches my age, taste in music and pace. Unfortunately as I list these out here, I realize the words to most of these songs are not good, and actually go against my more thoughtful side, so please ignore that part. I guess I am not listening to the words at all, but getting the beat into my bones. Jackson Browne Running on Empty – kinda slow but a good warm up song. Southside Johnny and the Asbury Jukes Got to Find a Better Way Home. This one is peppy! Devo Whip it good – Strong steady beat. The Proclaimers I would walk 500 Miles – Seems slow, but it keeps me going. My method is to use my CDs, put them into the computer. I create a playlist folder and then move them onto my iPod. It’s frustrating that I can’t move my playlists onto my iPhone, but it does help that I can save my iPhone battery by not playing music on it. If I don’t have the CD, I can usually get it from the library. My other choice is to use my iPhone and listen on Pandora. I don’t have my channels worked out very well on Pandora because I don’t use it often enough. The results are usually less than satisfying. I am curious about Spotify. Some of my friends use it – I know Jill has really enjoyed using Spotify and she shared one of her playlists earlier this year. Some people listen to the podcast on it. How about you? I’m curious. What are your best workout songs from your playlist? Do you listen on headphones? How do you build your playlist?